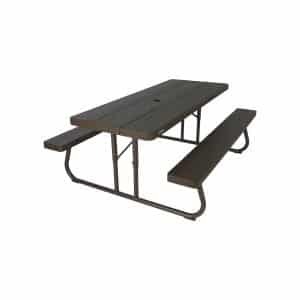 Hold outdoor cookouts and dine comfortably around this 6-foot foldable picnic table. The UV-protected, high-density, powder-coated steel construction withstands environmental elements and resists rust and cracking for easy maintenance and longevity. 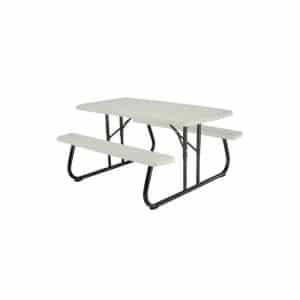 This picnic table is in-store pickup only. You may purchase it through the website and we will hold it for 48 hours for you to arrange pickup. 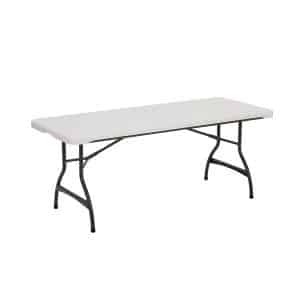 Lifetime 6-Foot Light Commercial Folding Table – Features a 72 in. x 30 in. molded tabletop (white granite) with a round folding frame (gray).